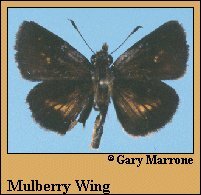 Identification: Wings are dark brown to black, relatively short and rounded. Upperside has small (male) or larger (female) yellow spots. Underside of hindwing has a large irregular yellow patch; rare individuals are rust colored and have no patch. Life history: Males patrol with a low, weak, meandering flight through marshes in search for receptive females. Flight: One brood from late June to mid-August. Habitat: Freshwater marshes or bogs. Range: New York and Massachusetts west across the Great Lakes states to southern Minnesota and North Dakota. A coastal population ranges from southern New Hampshire south to Maryland.